The Eames Home, also known as Case Study #8, is a landmark of midcentury architecture. It was designed by residential architects Charles and Ray Eames, who were a husband and wife team instrumental in creating the Midcentury Modern style. Charles (right) and Ray Eames. Photo via PBS. The Case Study houses were created to experiment with residential design and find an inexpensive, efficient, and architecturally pleasing single family home design for soldiers returning from World War II. Case Study homes were designed by a number of prominent architects, including Richard Neutra, Raphael Soriano, and Eero Saarinen. The house is located on a 1.4 acre lot in Pacific Palisades, in a beautiful wooded bluff along the sea. The original design of the house envisioned a raised box dramatically spanning the lot and cantilevering over the meadow in the front yard. In line with other Case Houses, the Eames House was supposed to be built from pre-constructed parts from a steel fabricator. However, steel shortages after the war delayed the shipment for three years. During that time Charles and Ray fell in love with the front meadow, and redesigned the house to sit along the ridge line in order to preserve the meadow. Rendering of the new design, showing the main house and studio. Photo from Wikimedia Commons. The new design built the house into the slope opposite the meadow. Other changes include the addition of a mezzanine level with bedrooms overlooking the double-height living room and a courtyard separating the studio from the main house. You can see the original 1946 photos of the house here - including construction photos if those interest you. View of the Eames House showing part of the preserved meadow and Eucalyptus trees. Photo via Wikimedia Commons. 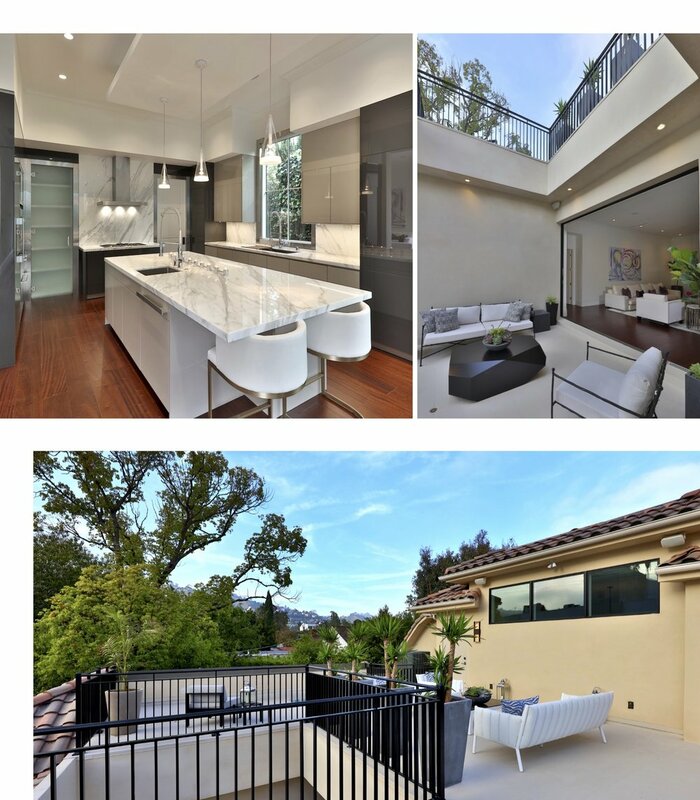 Residential design in Pacific Palisades had never seen a house like Case Study #8. The Eames house is largely considered one of the most successful Case Studies houses - it is both an architectural statement and a functional living space. The Eames lived in it until their death, a testament to the house’s functionality and success. The interiors of the Eames house have remained largely untouched since Charles and Ray’s death. Photo via We Are Scout. The Eames House has been operated by a foundation since 2004. In 2006 the house was designated a National Historic Landmark. Our architecture team had a great time working on this "Classically Modern" West Hollywood project in collaboration with Chelsea Design Associates. We were thrilled that DIGS featured the Orlando project as a cover story for their May 2018 issue. Read all about the project below, and click the button below to see more photos. Top left: the oversized oversized chef's kitchen with top of the line appliances. Top right: the outdoor lounge area, located right off the interior living room and divided by a two-panel pocket door. Bottom: deck off the upstairs guest suites with tree line views. Ames Peterson was honored to be nominated for a BUILD Award in 2018. After a careful review of our work, the judges singled out our Wrightview project as the Best Luxury Californian Residential Project. The designer kitchen features Calcutta Gold Marble, top-of-the-line Thermador appliances, and custom African finished cabinetry. The Wrightview project was a labor of love between Ames Peterson and Jason Green at 2Form. Jason came to us with a vision to do an addition and remodel on a traditional home, converting it into a stunning modern oasis with an open-floor plan and contemporary finishes. Helping him design and permit a modern home that fit aesthetically in a traditional neighborhood was a challenge, but our team rose to the occasion. The result is a magnificent, modern update to a single-level shed roof home. The sweeping rooflines of the house come towards you as you approach the drive and its supporting stone columns give it a sense of strength and prominence that define its entry. We are incredibly proud of the success of this project, and thank Jason Green of 2Form for trusting us to bring his design to life. Ames Peterson looks forward to undertaking even more successful projects with 2Form over the coming years. Obtaining a building permit in Malibu can be confusing. Check out our infographic for easy-to-follow steps to secure a permit! The Stone Creek Ranch project combines the elegance of a French country manor with the comfort of the Mediterranean for a house that encompasses the best of both worlds.